Seizures are often the first symptom experienced when a brain tumor is present, which leads to a tumor diagnosis. This is contrary to the popular myth that headaches are often the first symptom of a brain tumor. Headaches are common with brain tumors, but studies show that it is actually a seizure or other neurological symptom that usually appears first. It is important to note that not all people with brain tumors experience seizures. Some types of tumors and their location make people more vulnerable to experiencing them. Those who do often have seizures that continue throughout treatment and are of great concern to both them and their treatment teams. Quality of life and compromise of independence are two major factors when someone experiences seizures. In some cases, seizures can pose great health dangers. When sudden abnormal electrical impulse activity in the brain occurs, the result is a seizure. 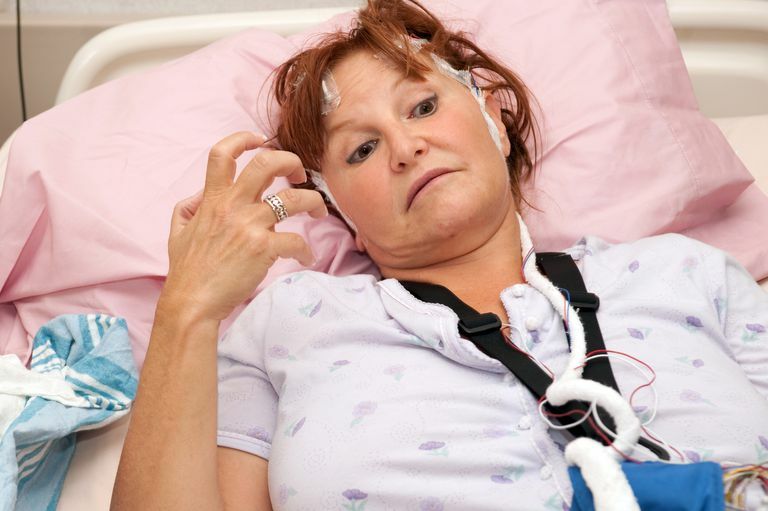 A seizure causes physical changes such as twitching or convulsions of the body, staring, momentary loss of bowel control and incontinence, and even loss of consciousness. It is a very serious condition and should never be ignored or left unreported to a physician. If you suspect that you may have had a seizure and are uncertain, report it to your doctor immediately. When most people think of a seizure, they usually think of severe tremors and jerking of the body. However, they can be much less severe, causing only the face or leg to shake, for example. Some seizures only cause people to stare blankly for a few minutes. What type of seizure a person experiences varies based on the tumor location in the brain. "The incidence of seizures is higher with primary tumors than with metastatic lesions, and among patients with primary tumors, seizures are less common with high-grade as opposed to low-grade gliomas. "Seizures may be the presenting symptom or develop subsequently. In two large series of patients with GBM, seizures were the initial manifestation in 18 percent and were present at the time of diagnosis (for an average of one year) in 29 percent. The frequency and onset of seizures in patients with brain metastases was illustrated in a series of 195 patients, in which seizures were present at diagnosis in 9 percent and subsequently developed in another 10 percent." This excerpt also points out that seizures are more common in people with low-grade gliomas (most common type of brain tumor in adults) than high-grade types. This shows that the severity of brain tumor symptoms is not related to how large a tumor is -- location, tumor type, and grade are key factors in what symptoms a person experiences, especially concerning seizures. Why Do Seizures Occur in People with Brain Tumors? Seizures can be common in people with brain tumors. Whether a person has had one or 100 episodes, controlling and preventing seizure activity is an essential part of brain tumor treatment for people with certain types of brain tumors. In most cases, the seizures themselves do no pose a great health risk (unless they last for several minutes or more); it is the environmental hazard that is a great concern. Seizures are not discriminative and can occur at any time, leading to possible injury of the person seizing and to those around him. There is a concern about people seizing during routine activities like driving or bathing. Plus, there is a heightened risk of head injury from falling during an episode. In people with brain tumors, seizures may be controlled with anticonvulsants or antiepileptic medication. Due to the high rate of seizure activity among people with some types of brain tumors, it is usually a standard part of treatment to include these types of drugs in order to prevent seizures. Not everyone requires medication to prevent or control seizures -- only patients who meet certain criteria. Want to learn more? See UpToDate's topic, "Clinical Presentation and Diagnosis of Brain Tumors," for additional in-depth medical information. Wong, Eric T., Wu, Julian K. "Clinical Presentation and Diagnosis of Brain Tumors." UpToDate.